Ananka's Diary: Did Google Street View Capture a Ghost? AWwww! I wish the image wasn't so distorted...... I guess that's the point. Aren't her legs just blocked by the steps? 2. What would a ghost being doing here? Yeah, good point Jin Ai! it's kind of like eating a cookie without knowing what flavor it is! I want to be a ghost. And a japanese ghost. being a ghost with an unidentifiable hair color and blue eyes that change color is just ridiculous. on the alien thing, thats either a wormhole or a lightsaber. there is no way that is a ghost! come on. remember the ghost from a few months ago. the one in the chapel or something what happened to that story, same as this: soon forgotten! Looks pretty fake-ish. Dakota: OK, I'm watchin for u on America's Most Wnated. lol. Ehh... A prank maybe?? Someone hacked google and stuck in the picture?? Someone attempting to make herself famous?? Sorry, but it looks more like someone in a long jacket and scarf to me. Maybe we're all just seeing things. Maybe we're crazy! I'm very interested in the alien one. A mysterious beam of light.... Aliens must be seriously talented. No human beings ever see them in person. Unless... they disguise themselves (like Betty Bent!). ROGUE: I like the cookie example! It'd be funny if that was really just a person, they'd be offened though. 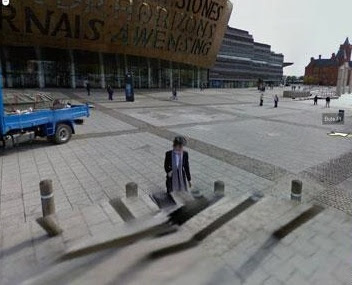 The shot of that building so reminds me of Torchwood! The figure's a bit weird, which would totally fit in in and episode of Torchwood. you're on a roll about ghosts, aren't you, Kirsten. whens kiki #3 coming out?????????? You can see the legs! This is probably an attempt at fame; it really reminds me of all those people that lined up on that one street (in Philidelphia, I think) with the marching band and all that. This woman must be pretty clever, though, to use local lore and a vintage outfit to pull it off! Ghost or not, I applaud you, lady! Well done! Not a ghost, end of story. Lioness: I LOVE the beatles!! !